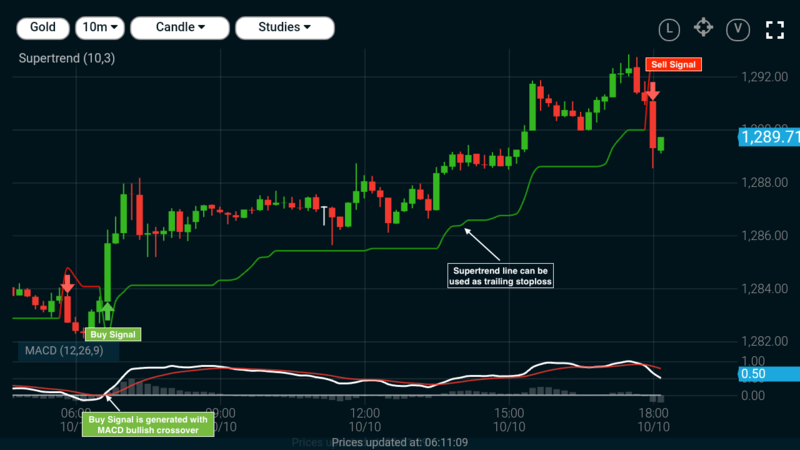 If you are an intraday trader & you use indicators to devise your trading strategies, then you must add Supertrend to your list. 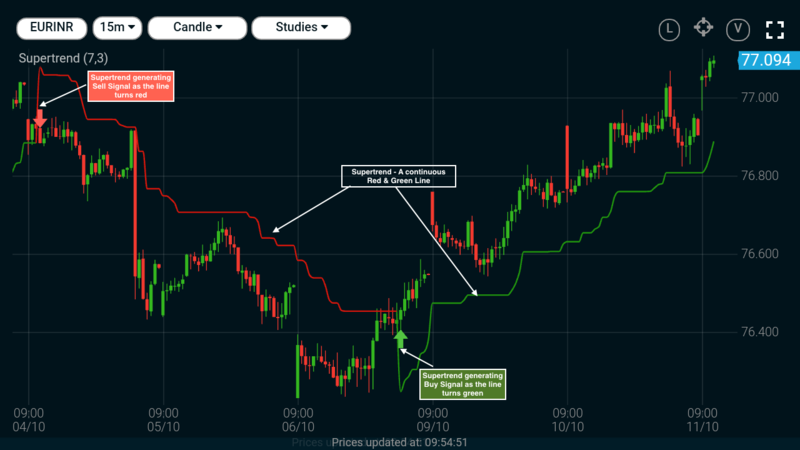 "Supertrend is a trending indicator and works well in a trending market (uptrends & downtrends) than in a sideways market." A Buy Signal is generated, when stock price moves above the indicator. At the crossover the indicator line turns green indicating bullish signal. Once a long position is initiated, hold the position till the price closes below the green line. A Sell Signal is generated, when stock price turns below the indicator. At the crossover the indicator line turns red giving bearish signal. Once a sell position is established, hold the position till the price closes above the red line. Both buy & sell signals can be used to initiate a fresh position or to close an existing position. Tip - Since, Supertrend is a trending indicator it works best when used in an uptrend or a downtrend. It may give false signals in a sideways market. 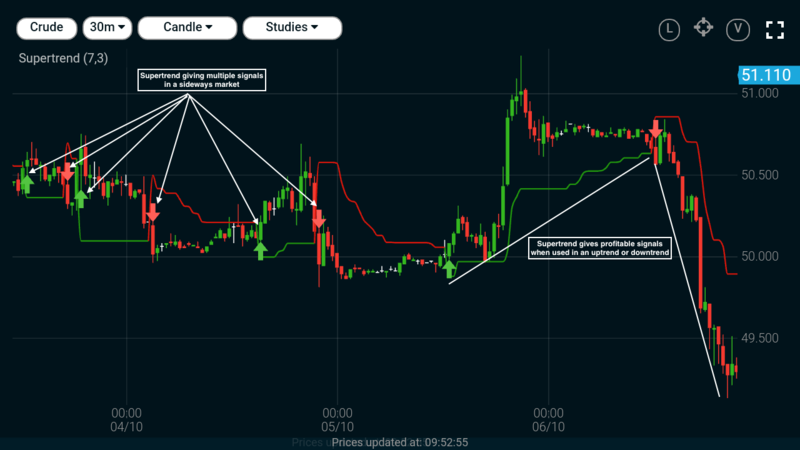 As indicated in the above 30 min chart of Spot Crude, supertrend fails to give a profitable signals in a sideways market and works well in a trending market. Consequently, Supertrend also generates a Buy signal as the gold price moves above the supertrend line & the line turns green. As both the indicators give a Buy signal, Enter a trade with a long position at $1283 and wait for the price to move below the supertrend line. Finally at $1289 level a Sell signal is generated to Exit the trade, as the price crosses and goes below the supertrend line and a profit of $5 is made in the trade. Next week, in the Market Vidhya lesson we will cover more strategies using Supertrend coupled with other indicators like RSI and EMA crossover. Stay Tuned to learn more and become an Expert Trader. डे-ट्रेडिंग में सुपरट्रेंड संकेतक का उपयोग कैसे करें? "सुपरट्रेंड एक ट्रेंडिंग सूचक है, जो ट्रेंडिंग मार्केट मतलब- अपट्रेंड या डाउनट्रेन्ड में बहुत अच्छे से काम करता है। साइडवेस मार्केट में इसका इस्तिमाल नहीं करना चाहिए।"